A refreshing drink which is sure to please. 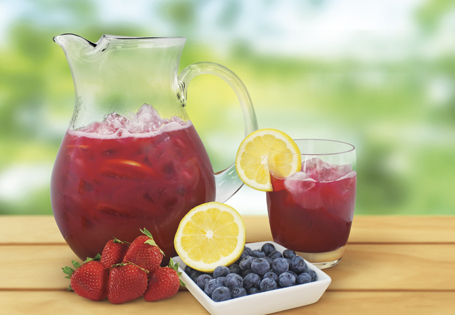 In a medium saucepan, combine blueberries, strawberries, lemon juice, honey and water. Bring to a boil and reduce to a simmer, continue to cook until fruit begins disintegrating and honey dissolves. Add tea bags and steep for 3 minutes. Remove tea bags and puree blueberry/strawberry mixture. Strain mixture into a large bowl and allow to cool. Serve over ice with sliced lemon as a garnish.